Pluto's tiny moon Nix (from the Latin word for "Snow"), is shown here in Absolute Natural Colors (as it was imaged by the NASA - New Horizons's Spacecraft "Ralph" instrument). 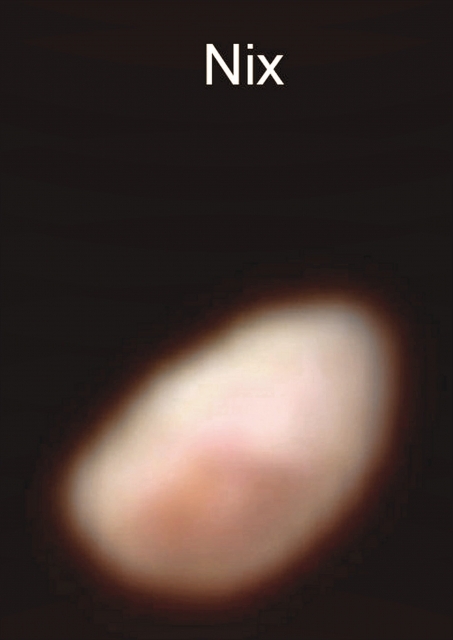 This Celestial Body seems to have a global pinkish color, as well as a relatively large orange/ reddish spot that is located in its Southern Regions - perhaps, in our humble opinion, as IPF, a huge and deep Surface Depression - a "spot" that has - obviously - attracted the interest of the Mission Scientists. The visual data shown here were obtained on the morning of July 14, 2015, and they were received on Earth on July 18. At the time when this specific observation was taken, the NASA - New Horizons Spacecraft was about 102.000 miles (such as approx. 164.152,68 Km) from Nix. The image shows Surface Features as small as approximately 2 miles (about 3,218 Km) across on Nix, which is estimated to be about 26 miles (such as approx. 41,84284 Km) long and, roughly, 22 miles (such as about 35,40548 Km) wide. The image (which is an Original NASA - New Horizons Spacecraft's falsely colored and NON Map-Projected frame published on the NASA - Planetary Photojournal with the ID n. 19847) has been additionally processed, magnified to aid the visibility of the details, contrast enhanced and sharpened, Gamma corrected and then re-colorized (according to an educated guess carried out by Dr Paolo C. Fienga-LXTT-IPF) in Absolute Natural Colors (such as the colors that a normal human eye would actually perceive if someone were onboard the NASA - New Horizons Spacecraft and then looked ahead, towards the Plutonian moon Nix), by using an original technique created - and, in time, dramatically improved - by the Lunar Explorer Italia Team.